Emirates FA Cup match preview Wolves vs Chelsea, 5th round. Important things to know; Kick-off: 17:30 BST, Date: Saturday 18 February, 2017, Venue: Molineux, Wolverhampton. 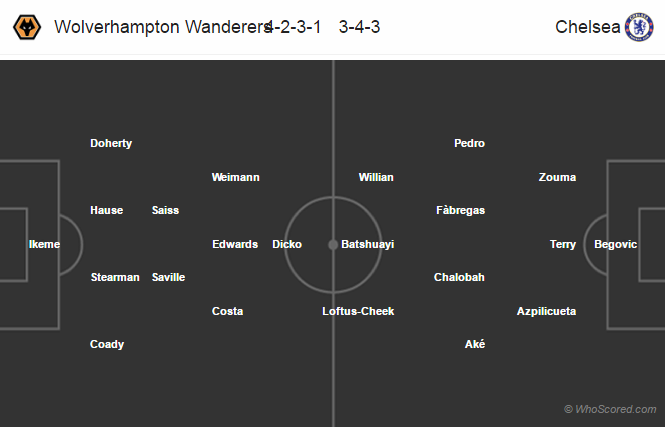 Wolves manager Paul Lambert will be starting with a similar lineup as of last win against Liverpool. Michal Zyro, Jordan Graham and Mike Williamson remain on the sideline through injury. Joe Mason and Jack Price both are doubtful for this game. David Luiz and Marcos Alonso both are back from their injury problems but are expected to take a rest. John Terry is doubtful for this game. The skipper might start if he returns from the injury. Diego Costa and Eden Hazard both are likely to be rested for this game. Rest of the squad is fully fit to choose from. Chelsea have won five of their last six games against Wolves. Chelsea have won three of their last four away games against Wolves, scoring nine goals and keeping two clean sheets in three games. Wolves have conceded 11 goals in their last three games against Chelsea in all campaigns. Chelsea have kept four clean sheets in their last six games against Wolves in all campaigns. Wolves 0 – 3 Chelsea, easy win for the visitors. Willian, Fabregas, Pedro on the score sheet.